Well it's official: President Barack H. Obama, with a stroke of his magisterial pen, has made the $787 billion stimulus package the law of the land. Americans can now breathe a sigh of relief knowing that their current state of high financial anxiety will be shared by generations to come. So what's so stimulating about the stimulus anyway? Other than its ability to spread monetary misery, no one knows for sure; not even the president or his top advisers. They don't seem very hopeful or upbeat, yet the American people were told that if the stimulus didn't pass and quick, financial Armageddon was imminent. Speaking on one of the too many shows that pass for nightly news, Congressman Peter Defazio explained why he voted against the stimulus: 'It included too many tax cuts and not enough spending on transportation projects.' A few seconds later he said that the stimulus would devalue the dollar and cause runaway inflation. Keep in mind he voted for the $800 billion plus stimulus bill. So using the congressman's logic, it would be OK for folks to work at a fast food restaurant for $8 an hour to have Uncle Sam 'withhold' $5 of it while charging $15 for an overcooked burger, burnt fries, and a watered down soda as long as they can ride the train to work? President Obama himself addressing those that were critical of his bailout plan said, 'In recent days, there have been misguided criticisms of this plan that echo the failed theories that helped lead us into this crisis . . . .' Is he talking about Bush's gargantuan expansion of Medicare, raising steel tariffs, TARP, the Patriot Act, the Faith Based Initiative, or No Child Left Behind? Obama doubts 'the notion that tax cuts alone will solve all our problems;' of course not, silly: they have to be accompanied by spending cuts. Writing in The Washington Post, Harold Meyerson unequivocally states, 'The essence of the crisis, and what distinguishes both the Depression and the current meltdown from every recession between the '30s and today, is that, left to their own devices, private lending and investment will not and cannot bounce back.' He conveniently skipped over the recessions of 1907, 1893, and 1873, which was at one time referred to as the Great Depression. The United States ' economy bounced back relatively quickly from all those with little or no intervention from the government and without the existence of a Federal Reserve System. Of course some private lending and investment companies will fail; that's what's supposed to happen to companies and individuals who make the wrong decisions in a free market economy. However, many will survive and new ones will enter the markets by snatching up assets at bargain prices, but I doubt this is the economic model Mr. Meyerson has in mind. His is probably more in tune with Fidel Castro's, which has done wonders for the Cuban economy, especially in the prostitution and vintage car markets. Daniel Gross, Slate.com's Money Box columnist, argues that government can create jobs: '. . . in the history of mankind, the government has in fact created many, many jobs. Today, government accounts for 22.5 million of the nation's 135.5 million payroll jobs, or 16.6 percent. Those numbers include people who work for the federal, state, and local governments'doctors and nurses in public hospitals and teachers at elementary schools and public universities.' What Mr. Gross's financial myopia prevents him from seeing is that it's not just jobs but productive and cost efficient jobs that help an economy bounce back and grow. By the best estimates (those of Obama and his advisers), each job 'created' or 'saved' by Obama's stimulus plan will cost $225,000. Other, less biased estimates put that number at close to $1 million. All that money is in some way being sucked out of the private economy causing productive job losses or preventing them from being created. Using both Obama's and Mr. Gross's logic, one would have to rate Mao and Stalin as the greatest job creators in history. Our nation's 22nd labor secretary, Robert Reich, writing in his blog, wholeheartedly defends Obama's mortgage plan, including the part that gives bankruptcy judges the power to rewrite mortgage agreements. If you think getting a loan is tough now, just wait 'til something resembling Obama's proposal passes: Not even Bill Gates will get approved for a $50,000 mortgage loan. Former Secretary Reich is also giddy about the 'massive expansion of the government's commitment to Fannie Mae and Freddie Mac,' even though by all economically sound and sane accounts that is exactly what caused the current mess in the housing market in the first place (the correct assumption by many that the federal government would step in and not let either Fannie or Freddie fail). In his statement after signing the stimulus plan, President Obama, referring to the ideas of lowering taxes and eliminating regulations to stimulate the economy, said they 'have been tested, and they have failed.' Tested by whom? Where? If President Obama was speaking about the United States , he is delusional (a condition shared by many in positions of power). Banking regulations alone have reached a point where the biggest and most expensive department in every bank in America is the government 'compliance' department, which generates zero revenues. Yes, once in a while the American people are treated to an illusory tax cut, but it is never accompanied by spending cuts, which causes higher deficits, inflation, and future tax increases. Much has been made about Obama's likeness in thought and persona to FDR, and many lauded the 32nd president on President's Day as one of this country's greatest. 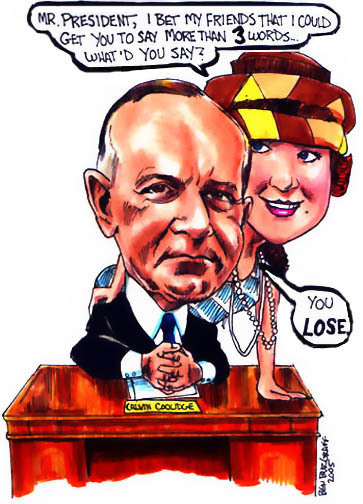 It is sad testimony to what the United States has come to when on such a day little or no mention was made of Calvin Coolidge (AKA Silent Cal). Obama and his predecessors (including the venerated FDR) would have done well to have taken some of Silent Cal's thoughts into consideration like, 'Perhaps one of the most important accomplishments of my administration has been minding my own business.' When considering how to deal with the 'Big Three' and failing banks, we all would be better off if Presidents Bush and Obama had heeded these words: 'Success is not final, failure is not fatal: it is the courage to continue that counts.' Many in Congress should have pondered the following before voting on the Patriot Act: ' Liberty is not collective, it is personal. All liberty is individual liberty.' Further, all politicians would do right by their constituents if they paid attention to this obvious observation: 'No matter what anyone may say about making the rich and the corporations pay taxes, in the end they come out of the people who toil.' How much money would have been saved if Theodore Roosevelt, Woodrow Wilson and every president since FDR would have paid attention to this: "No nation ever had an army large enough to guarantee it against attack in time of peace, or ensure it of victory in time of war," and for the rest of us "When people are bewildered they tend to become credulous"? Those who wish to preserve their sanity and dignity through the current crisis and beyond, would do well to remember the words of Harry Daugherty (Warren Harding's campaign manager): 'Greatness in the presidential chair is largely an illusion of the people.' No one knows for sure that the second coming of Calvin Coolidge would get the economy out of its current malaise, but any rational and nonpartisan person, which are fewer by the day, knows without a doubt that the second coming of FDR will only serve to make things much more difficult. Emiliano Antunez, 41, DDS Degree UCE Dom Rep, semi anarchist, quasi-nihilist, and a touch of pragmatist, with a penchant (Midas touch) for business and clueless in politics (campaigned hard for mayor of Miami and got less than 1% of the vote 'the masses are revolting'). Formerly on the Board of Miami Dade Housing and Finance Authority and currently serving on the board of the Overtown Community (in)Action Agency.